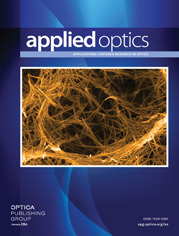 The author is with the Department of Optics and Acoustics, Université Libre de Bruxelles, 1050 Brussels, Belgium. Measurements made with an automated angle-resolved Mueller-matrix scatterometer are described. The instrument uses incident-polarization electro-optical modulation, division-of-amplitude photopolarimetry, and software-implemented Fourier-transform analysis of the detected signals to determine the scattered Mueller matrix of the sample. The measurement time is approximately 1 s per scattering angle. Applications to the control of surface roughness and structure on rough steel sheets (galvanized and uncoated) and of the properties of transparent birefringent optical elements (liquid-crystal devices) are discussed.